Evidence of the catastrophe on Cheat River may remain somewhere beneath its surface. Photo courtesy Rick Burgess. The strange story of the “day they knocked a hole in the Cheat River” has been passed down as one of West Virginia’s obscure but enduring legends for more than a century. Some historians have questioned whether the tale is historic or simply an astonishingly good story. Though fantastic, the events as described in the following selection from the W.Va. Heritage Encyclopedia (Vol. 5, page 941) are certainly conceivable. 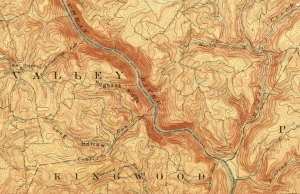 The following version can be traced to the November 14, 1885, edition of the Weston Democrat, according to Gordon C. Baker, of Rockville, Md., who later contributed the story to the encyclopedia. “A lot of crazy things have happened in West Virginia, but the day they knocked the hole in the Cheat River is one of the best. 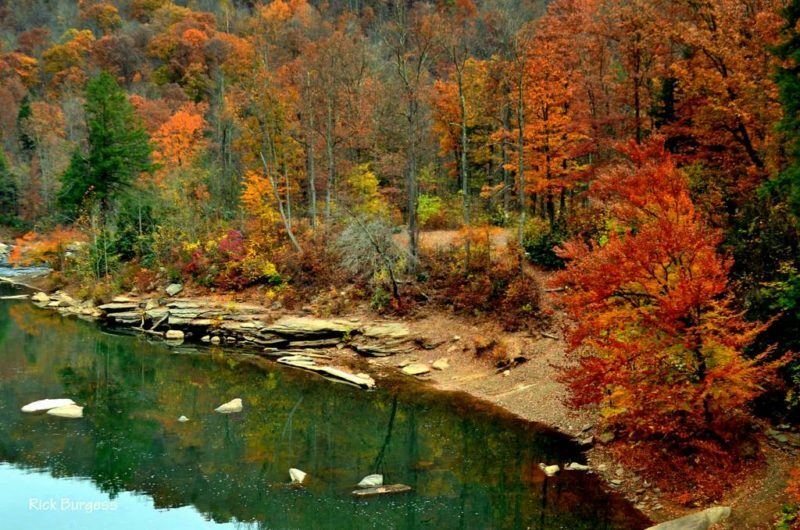 About fifteen miles north of Kingwood, along the Cheat River, can be seen some of the most rugged and inspiring scenery to be found any where in West Virginia, if not North America east of the Rocky Mountains. On the other side of the river for probably half a mile rises a perpendicular wall of solid limestone about 350 feet high. From the top of the walls of cliffs, the craggy and timbered mountain looms up more than 2,000 feet. Near the top of this mountain had stood for unknown ages a great rock, measuring 20 feet from top to bottom and averaging about 18 feet in thickness. It contained about 9,420 cubic feet of hard, flint-like limestone and, allowing 100 pounds to each cubic foot, the weight of the monster was 948,000 pounds or 324 tons. Just below and against the lower side of this rock was a large oak, which seemed to be the only support the rock had to keep it from dashing down into the river. I first heard of the rock a few days ago from a party of young Kingwood men who had been down in that region exploring. They said that it was the intention of several persons who lived in that neighborhood to cut away the large oak tree that stood below the rock and give the rock a start down the mountain. On last Wednesday, the 7th, one of the party received a letter informing him that a crowd had been organized and that the work would begin on Saturday the 10th. I went down on Friday morning and on Saturday went to the scene. There were about 25 persons present from the neighborhood. The work was done by a company of six men organized for the purpose. The tree was cut down and fell crashing over a considerable precipice and lodged, but the great rock stood unmoved. The next thing to do was to find how much of the rock was embedded in the earth. Digging and shoveling continued for nearly two hours, and, owing to the steep slope on which the men had to stand, it was not easy work. Great care had to be exercised also, for it was impossible to tell at what moment the rock might start thundering down the mountain. It was decided to be too dangerous to dig any longer, for the rock was then in a position to lose its equilibrium from the slightest touch. One of the men pushed against it with his hand, but its weight defied his strength. A lever was cut, and a fulcrum was erected. The lever was soon bending with the united efforts of several men of no ordinary size. I was up the mountain probably twenty yards from the rock to get a good view of its course to the river, and was watching closely for the start. “Now she goes!” came to my ears, and I could see the top of the great rock going out from the mountain — now slow, now faster, now a crash then crash upon crash. The scene presented by that rock, tearing and thundering down the mountain, can be imagined, but cannot be described. It had a tendency to confound the sense and bewilder the reason. Great trees were torn from the earth and hurled into the air, like twigs in a whirlwind. And trunks of mammoth oaks were torn and slivered in quick succession. On and on it went, making a clean-cut road from the start. The mountain trembled and the spectators stood spellbound. The rock gained speed as it neared the river, which was in view of the lower end of the great lime wall. It now struck the last precipice and, after going outward and downward for more than 200 feet, it fell into the river with a roaring sound. After the dust and leaves and flying pieces of limb had settled, we could see a peculiar action of the water but were too far off to discover the cause. A walk of more than a mile around—as it was next to impossible to go straight down the mountain from where we were—brought us to the river, but instead of seeing the rock, we saw the water rushing from every direction down into a huge hole probably 30 feet square. During the half hour we were standing there not less than ten saw-logs were drawn into the hole and disappeared. It is supposed that a cave extends under the river and that the weight of the immense rock coming down with such force and rapidity caused the roof to give away. Whether or not the water will soon fill the hole up and the river carry on as before will depend upon the extent of the existence of an outlet to carry the water from the cavern to some other stream or to some other part of the country.